With Amy Winehouse passing away on Saturday, 23rd July 2011, the world lost a true icon who in her tragically short 27 years, managed to surpass her field of music to become a cultural tour de force. It is hard to believe that Amy received worldwide fame and numerous prestigious awards, when she only released two albums- ‘Frank’ (2003) and ‘Back to Black’ (2006). I must confess that it was the latter album that made me aware of who she was as an artist. And I feel very lucky that I got to see her perform live in Camden. Living in London at the time, it was so refreshing to see a British artist whose sound was as memorable and unique as their visual appearance. 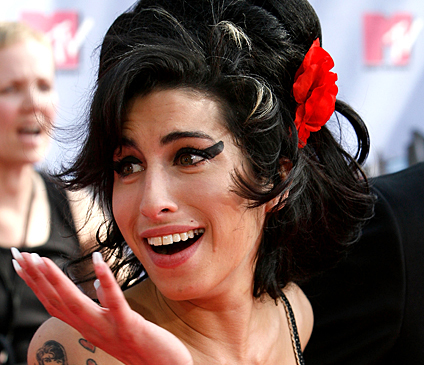 When doing research on Amy Winehouse on the Web, it is amazing how the negative press far outweighs the positive. We live in an era where the media and public build you up, only to wrench you back down and grind your reputation to a pulp. Unfortunately, due to the demons Amy was fighting and her out-spoken nature, she was an easy target for the press. I don’t feel the need to delve further into the personal battles that Amy fought, as that was not what fascinated me about her. 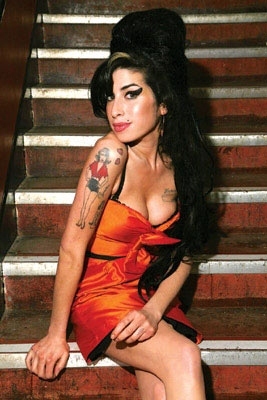 Furthermore, all one has to do is to google ‘Amy Winehouse’ to read the lurid details and speculations. I am far more interested in the songs she sang with that voice and the memorable visual journey she took moulding her personal image. The below images are my favourite Amy Winehouse pictures and how I want the world to remember her, and whilst you are looking at them, I’d like you to listen to that voice. Here we see a much more voluptuous -looking Amy with no tattoos, beehive and cat’s-eye makeup. Her choice of pastel colours, floral print and plastic jewellery are also interesting, ‘edge-free’ and almost ‘child-like’. However, there is still the trademark Amy ‘bosom doth overfloweth’ look. I absolutely adore her ensemble in this image- she managed to carry of so many cultural references at once- the ratty oversized beehive hair-do, cat’s eye makeup and tight, short outfits were an ode to the girl groups of the 60’s (like The Ronettes). Amy was definitely a champion of the ‘underwear worn as outerwear’ trend, and the titillating showing of her cleavage and push-up bra is offset with her cartoonish (child-like) hand bag. Her red patent ‘heart’ bag, looks like something Bettie Boop or Minnie Mouse would kill to get their sketched mitts on. And then her overtly feminine image is juxtaposed with an assortment of very masculine ‘in your face’ sailor tattoos. That is what I love about Amy, you couldn’t put her in a box. I also found it interesting to learn that Amy had an emotional approach to her styling, as she once confessed, ‘The more insecure I feel, the bigger my beehive gets’. This explains why sometimes it looked like her slight weight would topple under the weight of her exaggerated coiffure. Fashion houses are always quick to ride the shirt-tails of the new ‘It-thing’ and in 2007, Karl Lagerfied sent the models in his 2007 London Chanel pre-fall show down the catwalk with high hair and dramatic eyes in her honor. â€œShe is a beautiful, gifted artist,â€ Lagerfeld said at the time. â€œAnd I very much like her hairdo. I took it as an inspiration. Because, in fact, it was also Brigitte Bardot’s hairdo in the late fifties and sixties. And now Amy has made it her own style. For me, it was a double clin d’oeil. It is Brigitte Bardot and Amy Winehouse.â€ Fast forward a few seasons later, he had crowned another young British artist as his muse-Lily Allen. Such are the transient tastes of fashion and all it holds dear. After her award-winning album ‘Back to Black’ was released, Rehab became the most popular track at fashion shows. The track played at Comme des Garcons and Dior – two wholly different brands with different target audiences-showing how special the song really was. I haven’t done the research but I’m sure with the release of the album, black eye-liner sales soared. After all I remember going to the MAC counters and insisting they give me the necessary war paint to create ‘Amy Winehouse eyes’. That’s when you know a music artist has made it, when they can command sales in record stores, make-up stores, vintage shops and the like. I was also a fan of Amy’s colourful use of headscarves. Amy also like to show her softer side by wearing essentially ‘cute summer dresses’. But she always made the look her own by donning heavy statement, gold, rap jewellery. In 2010, Amy was enlisted by, one of her favourite brands- Fred Perry– to design a collection inspired by her style. The collection sported her signature look including polo shirts, skinny pencil skirts, capri pants, mini dresses and twin sets. 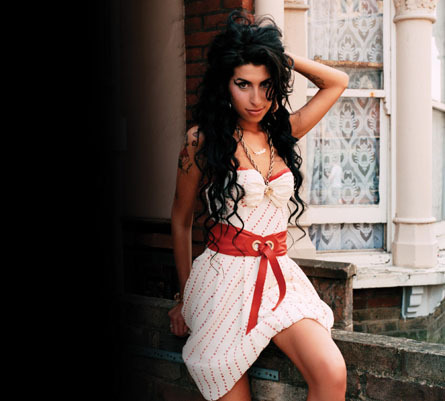 Which is your favourite Amy Winehouse image and song?